"If I wasn't the director I'd find a way to be involved here." That statement was made by Jessica Schramm about One River School of Art + Design, opening this weekend in Lake Oswego. Schramm just happens to be the director of the new art school, which she describes as "a fun place where kids can follow their interests in art and building relationships with working artists." Founded in September 2012 by former School of Rock CEO Matt Ross, One River School was established in Englewood, N.J., as an art education corporation with an ambitious mission to transform art education in America. Ross followed the initial success of School of Rock, a chain of suburban music schools that grew from five locations to 55 under his leadership, to make art classes accessible and as desirable as music lessons. 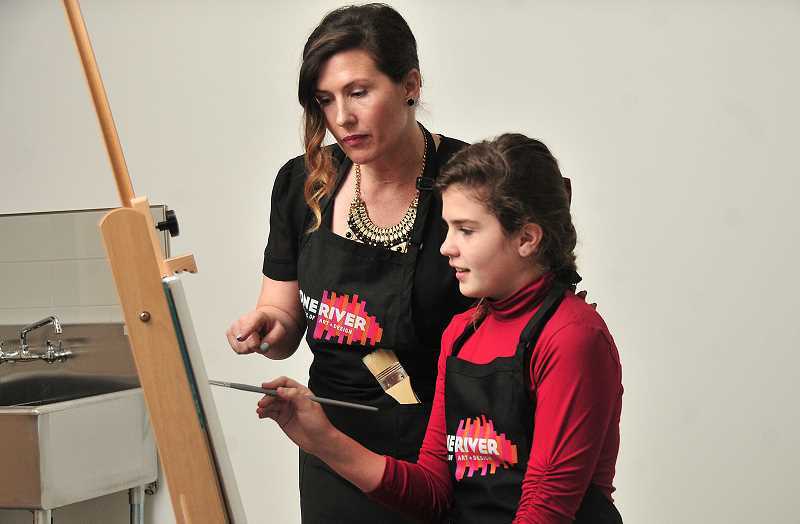 One River aims to support and inspire new generations of artists and create employment opportunities in the arts. The school has grown to operate franchises in Illinois, New Jersey, New York, Texas and now Oregon. Lake Oswego resident David Kabaker is the local owner and he plans to open three more Portland area locations over the next few years. 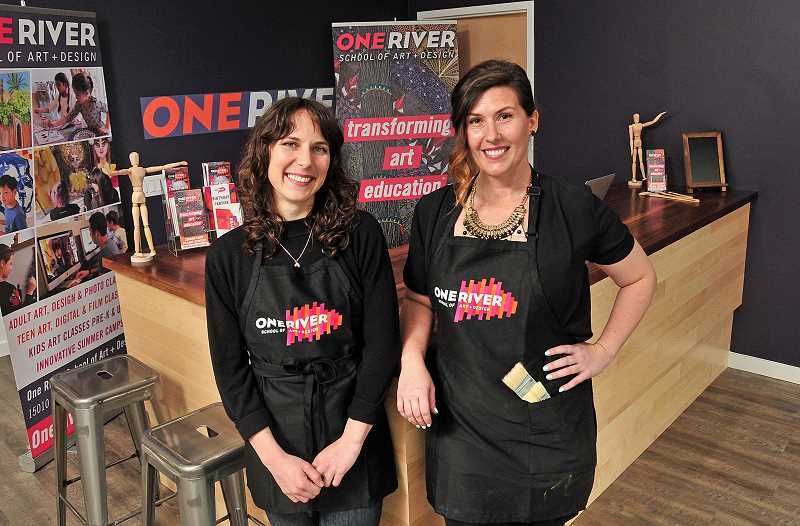 "One River will have a big impact in Lake Oswego and throughout the Portland area on kids and adults who want a special place to learn to make art and have fun doing so," said Kabaker. "I also like the idea of providing jobs and a career path here for artists who have traditionally had limited options." Schramm says the school will offer a wide variety of art classes and creative courses. Students enroll in what interests them — it could be drawing, digital art, photography, design, filmmaking or other media. If a class isn't offered in something a child is interested in, Schramm says they can find an artist to teach it. Often children have artistic interests and talents but parents don't know how to coax that natural ability out of the child. "We want to be there for them," Schramm says. "This is a great way to give them the support they need. And these are classes they won't get in public schools, like street art, fashion, anime and contemporary art." Schramm says she is excited to get One River involved in the community, and that Kabaker's long history of support for community events and projects lays the groundwork for the school to become a contributor. Grand opening events will be held this Saturday and Sunday, May 5 and 6, from 10 a.m. to 3 p.m. at the school, located at 15010 S.W. Bangy Road in Lake Oswego. Attendees of all ages can enjoy free art and digital workshops, tour the state-of-the-art studios and digital suite, and meet the staff and instructors. Guests are also invited to attend an art opening of Jay Gaskill's solo exhibition at the school from 5 to 9 p.m. May 5. He will hold a question and answer session at 5 p.m., and refreshments will be served. One River School of Art + Design is now enrolling for its summer camps for children in kindergarten through grade 12. Camps are divided by age groups; choose from camps with focuses on Graphic Novel Illustration and Street Art Painting, Short Film Creation, Drawing from Nature and Jungle Masks and many other classes. View the complete list of options online at www.OneRiverSchool.com. New members can receive a $75 discount on summer camp enrollment when they sign up by May 31. Use the code SUMMERFUN on checkout at www.OneRiverSchool.com or call 503-606-8861. One River School of Art + Design is located at 15010 S.W. Bangy Road in Lake Oswego.